Much has been said about a rumored Amazon tablet so far. It should be based on Android, we are told, and Asian source have chimed in with their share of leaks, the latest being that Taiwanese contract manufacturers have begun producing the gizmo, presumably for a Fall launch. But will you take the plunge? That’s what research firm Retrevo set out to figure out in a July study stemming from polling over a thousand online individuals in the US. Key takeaway: Amazon tablet must be really affordable if it’s to hit the ground running. 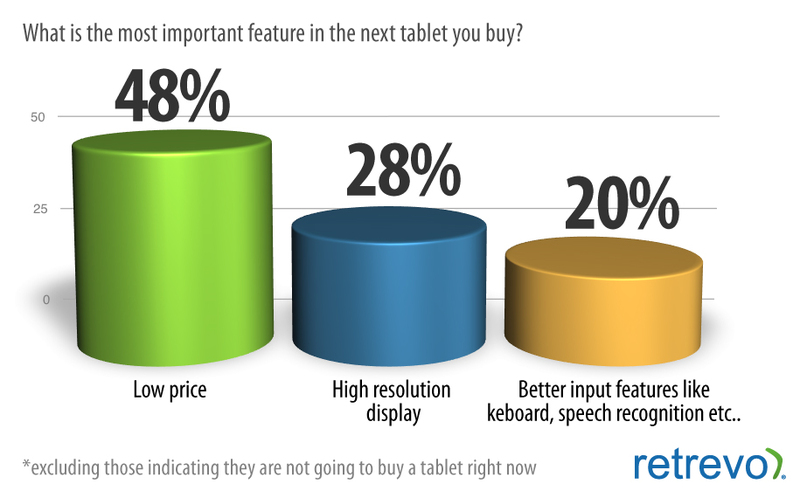 Asked whether they’d consider buying any Android tablet with similar features over a base model $499 iPad, more than three-quarter respondents, or 79 percent, said “Yes, if it cost less than $250”. Amazon is rumored to be skipping on some tablet features in order to keep production costs down, like use a less expensive touch panel which can only detect two fingers at once. Of course, Amazon knows how to build gadgets like Kindle and make them less expensive over time. The tablet, however, they’d have to price aggressively from day one as Apple pretty much set the starting price at $499. Nearly half the respondents would choose an Android tablet over an entry-level $499 iPad if it was priced less than $300 and nearly one in three would go Android with a sub-$400 device. 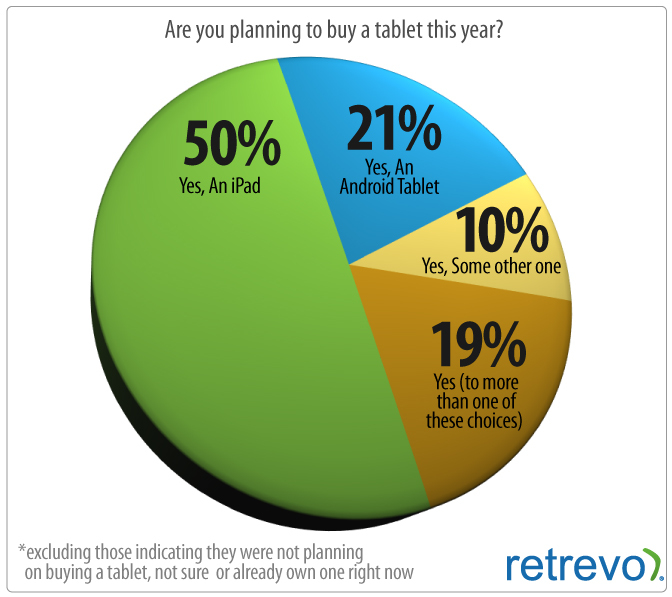 One in five (21 percent) plan on buying an Android tablet this year versus 50 percent of those planning an iPad purchase, which is somewhat consistent with a Strategy Analytics finding that Android tablets grabbed one third of the market in June. And for all the talk about high-resolution Retina Display on a rumored iPad 3, this is the most important feature for just 29 percent of tablet buyers. Low price, on the other hand, matters to nearly half the respondents, or 48 percent. 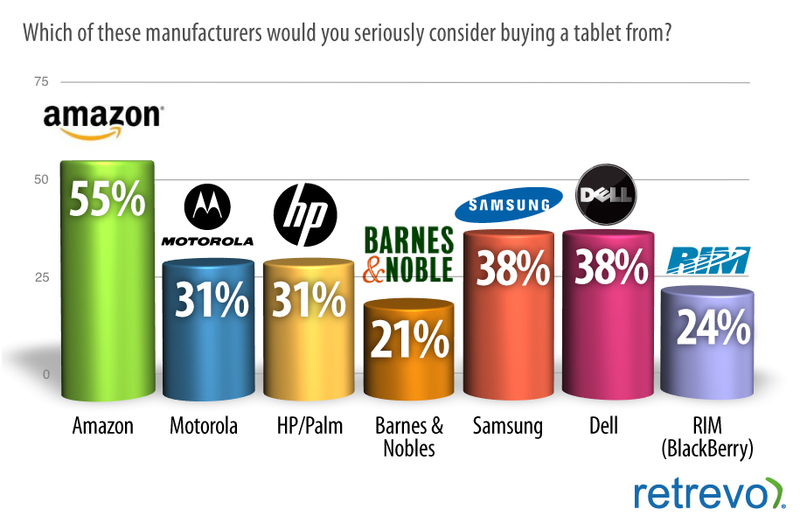 Vendors are well aware of this and some have already undercut iPad on price. Apple on its part is rumored considering cheaper components for iPad 3 in order to keep it competitive. In all, if Amazon pulls its resources together and creates an integrated package featuring tight interplay of hardware, software, cloud services and content stores – and aim for volume and low price – they could emerge as a big surprise in the tablet game.